Objective of Palmistry is to give accurate predictions about future but its utility lies in the correct and effective solutions to our problems. Palmistry is highly beneficial because with the help of this knowledge we come to know about our future and forth coming good or bad events. Rightly has some body affirmed, “To be forewarned is to be forearmed”. When we know it in advance that something negative is likely to happen to us we prepare ourselves to face that or avert that by equipping ourselves with necessary tools and weapons for our protection. Here in this book of AIFAS the readers are informed with all the remedial measures. 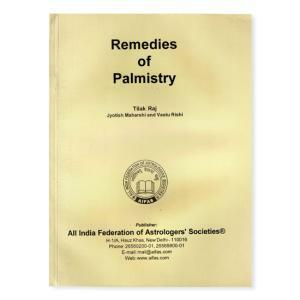 Astrologer gives remedies on the basis of his knowledge of reading a horoscope whereas a palmist recommends remedies on the basis of his interpretation of shape of hand and fingers with lines and mounts on palm. Different methods of remedies are recommended in this book. This book talks about the remedies like worshipping the planet, prescription of yantras of planets alongwith mantras, gems and rudraksha. This books also talks about rare tantrik items with the use of which one can enhance his / her destiny. Remedies for sadhesati of Saturn alongwith method of worshipping of deities related to the planets have been given in the concluding chapters of this book.